The dog days are finally here, and the second timeline of July could not miss the appointment (first part here). 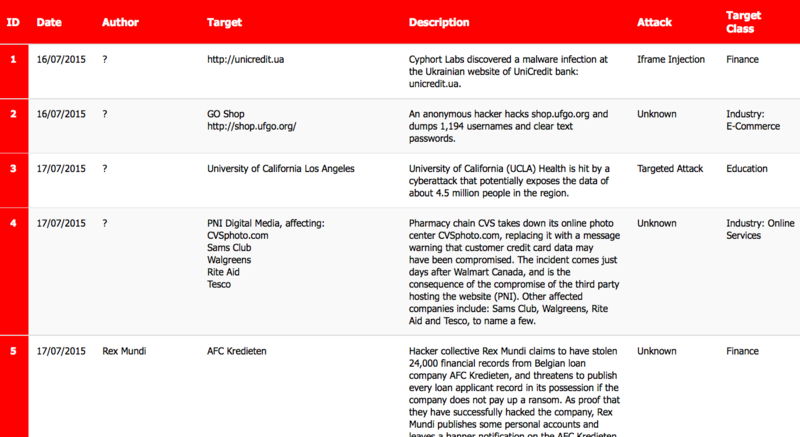 The list of the most noticeable breaches of the second half of the month includes the University of California Los Angeles (4.5 million records potentially compromised), Ashley Madison (37 million users exposed could pay a high price for their extramarital affairs), the United Airlines, which fell victim of the same hackers who breached Anthem (and maybe this explains their bug bounty program) and, last but not least, the University of Connecticut School of Engineering. Canada was still under attack from the hacktivists orbiting around the Anonymous collective in the wake of the controversial C51 bill and the protests following its approval in which an alleged member of the collective was shot dead. Scroll down the timeline to have a complete view of the threat landscape for July and, as usual, remember to keep the level of attention very high. In the same time if you want to have an idea of how fragile our electronic identity is inside the cyberspace, have a look at the timelines of the main Cyber Attacks in 2011, 2012, 2013, 2014 and now 2015 (regularly updated). You may also want to have a look at the Cyber Attack Statistics, and follow @paulsparrows on Twitter for the latest updates.